Scientists have unearthed a total of 10 skeletons including those of children as well as adults in a burial ground in Mexico in a peculiar circular/spiral arrangement. 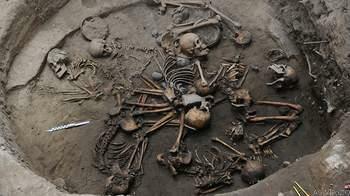 The skeletons were found in Tlalpan, a city located in southern frontier of Mexico. After a study of the skeletons, researchers have confirmed that two out of the ten skeletons belong to the female gender while one was a male. These skeletons have been estimated to be 2,400-year old. The rest of the skeletons are currently being studied. However, most of these skeletons belong to children out of which the scientists have been able to identify a skeleton of a baby who was around one-month-old while another child was between the ages of three to five. A researcher from the Pontifical University of Mexico, Jimena Rivera Escamilla stated that the alignment of the bodies suggested that they were placed one upon the other.Escamilla also stated that the individuals could represent the circle of life that starts from a baby growing into a child followed by being an adult and ultimately the death of that particular individual again to start with the baby phase.The researchers have been unable to determine the cause of their death. The bodies were also seen holding earthen bowls and pots.